Hi, my name is Sky. 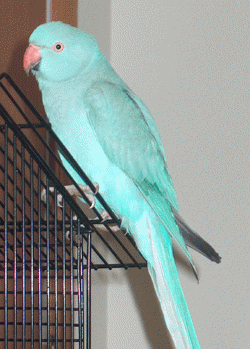 I am an Indian ringneck parakeet. When I came to my new home my name was Nike (like the shoes) but my Mom thought I was such a beautiful blue color like the sky she named me Sky. I was very shy at first and would not come out of the cage but after I found out that I was really loved I ventured outside of the cage and to this day, spend most of my time out of the cage. My Mom bought me a great big cage about a month ago and boy do I think I am queen of the hill. I live in my Mom?s home office with nice windows and my other feathered friends. Mom is home most of the time because she works out of her home so, we are really spoiled. I have a Dad too and sometimes I would rather him hold me then my Mom. I like to ride on shoulders but not for to long because I really like to be in and on my cage instead. Mom bought me a nice big perch with food cups but I don?t like it why, I really don?t know but with time maybe I will change my mind. She also bought me a great big bird bath which I really love! Splashing around in it is so much fun! I am a very picky eater but some like vegetables, some fruit, some seed and pellets and of course, raw almonds are my favorite. We also have two dogs at my house named Beauty and Amber. I love them too because they are so mellow. They know I am their friend and I can even walk right in from of them and they won?t even budge. Well, this is my story. I look forward to a happy long life in my new home.